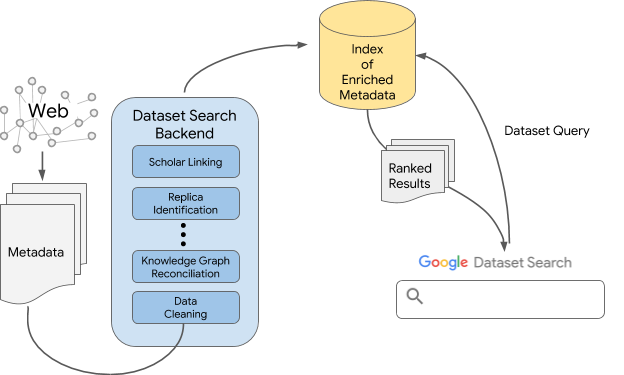 When Google’s search engine processes a Web page with schema.org/Dataset mark-up, it understands that there is dataset metadata there and processes that structured metadata to create “records” describing each annotated dataset on a page. The use of schema.org allows developers to embed this structured information into HTML, without affecting the appearance of the page while making the semantics of the information visible to all search engines. Despite these variations, Dataset Search must provide a uniform and predictable user experience on the front end. Therefore, in some cases we substitute a more general field name (e.g., “provided by”) to display the values coming from multiple other fields (e.g., “publisher”, “creator”, etc.). In other cases, we are not able to use some of the fields at all: if a specific field is being misinterpreted in many different ways by dataset providers, we bypass that field for now and work with the community to clarify the guidelines. In each decision, we had one specific question that helped us in difficult cases “What will help data discovery the most?” This focus on the task that we were addressing made some of the problems easier than they seemed at first. Google’s Knowledge Graph is a powerful platform that describes and links information about many entities, including the ones that appear in dataset metadata: organizations providing datasets, locations for spatial coverage of the data, funding agencies, and so on. Therefore, we try to reconcile information mentioned in the metadata fields with the items in the Knowledge Graph. We can do this reconciliation with good precision for two main reasons. First, we know the types of items in the Knowledge Graph and the types of entities that we expect in the metadata fields. Therefore, we can limit the types of entities from the Knowledge Graph that we match with values for a particular metadata field. For example, a provider of a dataset should match with an organization entity in the Knowledge Graph and not with, say, a location. Second, the context of the Web page itself helps reduce the number of choices, which is particularly useful for distinguishing between organizations that share the same acronym. For example, the acronym CAMRA can stand for “Chilbolton Advanced Meteorological Radar” or “Campaign for Real Ale”. If we use terms from the Web page, we can then more easily determine that CAMRA is in fact the Chilbolton Radar when we see terms such as “clouds”, “vapor”, and “water” on the page. It is probably clear by now that Dataset Search is only as good as the metadata that exists on the Web pages for datasets. The most common answer to the question of why a specific dataset does not show up in our results is that the Web page for that dataset does not have any markup. Just pop that page into the Structured Data Testing Tool and you will see whether the markup is there. If you don’t see any markup there, and you own the page, you can add it and if you don’t own the page, you can ask the page owners to do it, which will make their page more easily discoverable by everyone.